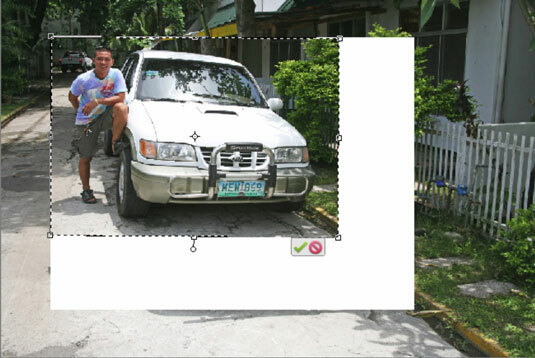 When you open a photo in Photoshop Elements 11, the photo rests on an underlying layer called the canvas. The canvas and the photo are at a 1:1 ratio. In essence, the canvas is the physical size of your image. You can keep the canvas size fixed while upsizing or downsizing the photo image. To do so requires using the Transformation tools. Choose Image→Transform→Free Transform or press Ctrl+T (Command+T on a Mac), and you see a number of handles on the sides of the transformation rectangle. To scale a photo up or down, grab one of the four corner handles by clicking one and holding down the mouse button; then you can move the handle in or out to size the image down or up, respectively. If you open a context menu after you’ve selected Free Transform, you find several transformation commands. Choose the Scale command to size an image up or down. As you drag the corner handles, the scaling is made while constraining proportions. The end result of scaling images is the same as using the Image Size dialog box to upsample and downsample images. As you scale an image up, the image loses resolution. 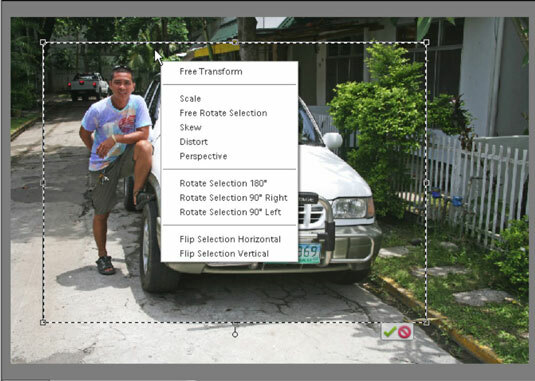 As you scale an image down, it gains resolution. Therefore, when scaling images up, be certain that the image resolution is sufficient to support the new size. Here, the image is scaled down by dragging a handle on the Transform rectangle and slightly rotated the image. The Transformation rectangle is shown before you commit the edit.